Looking for a terrific, laugh-out loud mystery featuring a one-of-a-kind dog as narrator? I enthusiastically recommend the Doodlebugged mystery series written by the award-winning author Susan J. Kroupa. Doodle’s antics are the perfect choice for dog lovers on your holiday shopping list. With four books now in the series, this is the perfect time to catch up with Doodle. Each book can be enjoyed as a stand-alone, but why stop at just one? Grab a copy of each and share the joy of Doodle this holiday season! All four in the series are budget-priced PLUS Bad-Mouthed (#4) will be on sale for just 99¢ as part of a one-day-only special on Saturday, December 12th. Grab it while you can! Doodle’s antics during the pageant draw the attention of a popular video-blogger, who asks to do a feature on his sniffer-dog skills. But when the blog airs, pretty much the opposite of what Molly and the boss expected, the boss’s phone rings off the hook with distraught customers who think Doodle’s bed bug “finds” can’t be trusted. Molly, searching for a way to set things right, befriends the blogger’s son, a boy alienated from his mother who wants only to go live with his father. 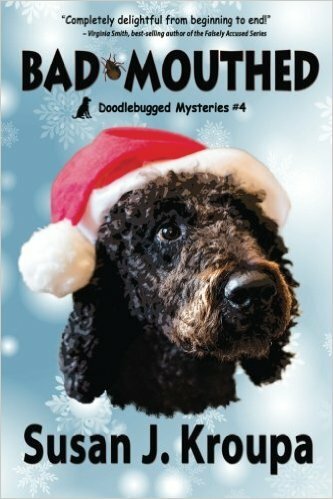 Throw in a handful of threatening letters, some lost dogs, and a devastating fire, and Molly and Doodle have their hands full—well, in Doodle’s case, his paws—finding out just who’s been naughty and who’s been nice. A charming cozy for all seasons and for dog lovers of all ages. Susan J. Kroupa is a dog lover currently owned by a 70 pound labradoodle whose superpower is bringing home dead possums and raccoons and who happens to be the inspiration for her Doodlebugged books. She’s also an award-winning author whose fiction has appeared in Realms of Fantasy, and in a variety of professional anthologies, including Bruce Coville’s Shapeshifters. Her non-fiction publications include features about environmental issues and Hopi Indian culture for The Arizona Republic, High Country News, and American Forests. You can find her books on her website as well as her Amazon sales page. This entry was posted in Authors You Might Like, Books, Dogs!, Home page, Writing and tagged Doodlebugged mysteries, labradoodles, mystery fiction, Susan J. Kroupa, Writing. Bookmark the permalink. Susan, thank you SO much for the lovely post! My pleasure, Sue! I really enjoy this series, and who couldn’t love Doodle? I’ve shared this with lots of folks and am happy to see this book is racing up the charts this weekend. My neighborhood is home to quite a few labradoodles and goldendoodles–we’re thinking of starting a Doodle fan club!